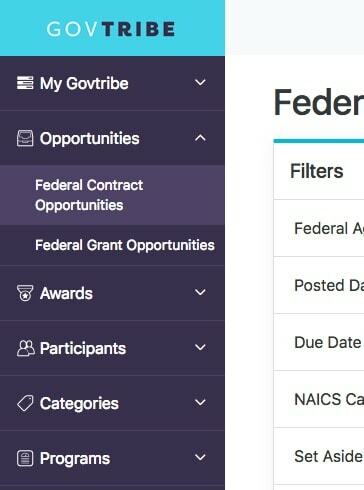 Chances are, if you are on GovTribe you are interested in learning about or bidding on federal contract (or grant) opportunities. GovTribe makes searching for opportunities very easy. Prefer a video tutorial? Find one here. On the search page, you are presented with a side bar of various filters you can use to narrow your search. This includes filtering by federal agency, NAICS category, posting date or response due date, set-aside, and many more. You can also add a keyword search (or a solicitation number) in the main search bar at the top of the page. Use quotes for an exact phrase search. Once you have a search you like, you may want to add a Saved Search and receive email updates when new things are posted.